Shandygaff or Shandy, a beverage first invented in the United Kingdom, is beer flavoured with ginger beer or ginger ale. Carbonated lemonade or citrus-flavored soda may also be used. In German, this type of drink is called a Radler (German for "Cyclist") in Southern or Alster in Northern Germany. In French it is called a Panaché (French for "mixed", "motley"). Left: A can of Radler, German-style shandy. The proportions of the two ingredients are adjusted to taste, normally half-and-half, although shandy that is sold canned or bottled is typically much weaker (about one part beer to ten parts sweet soda). A more potent variation known as a Turbo Shandy is made from mixing lager with a citrus-flavoured or lemonade-based alcopop (e.g., Smirnoff Ice or Mike's Hard Lemonade). It is sometimes fortified with a shot or more of the base alcohol. In France, a panaché (meaning "mixed" or "motley") is beer mixed or flavoured with limonade (French-style lemonade), which is lemon-flavoured soda or soda water. Adding grenadine to the mix makes a Monaco. In Britain, a popular variant is the “lager top,” in which a small measure of clear lemonade or lime juice is added to the lager, usually about a centimeter. Biermischgetränke (“beer-based mixed drinks”) are popular in Germany. Sometimes a non-alcoholic beer is used, so that the drink has no significant alcohol content. Since a 1993 change in German tax law, Biermischgetränke are also sold pre-mixed in bottles. 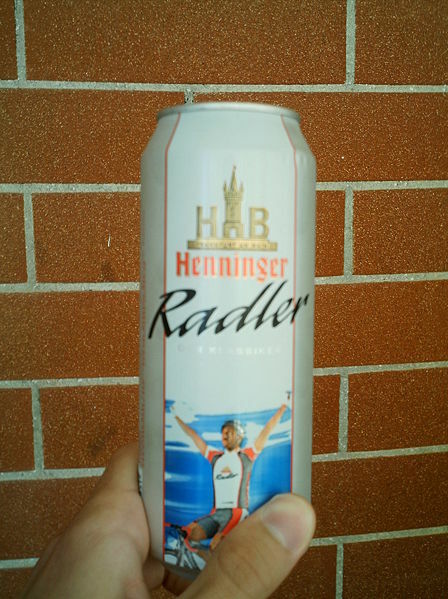 The Radler ("cyclist") is a Biermischgetränk with a long history in German-speaking regions. It consists of a 50%/50% or 60%/40% mixture of various types of beer and German-style soda pop. During the summer months, Radler is very popular there due to its reputation of being a thirst-quencher.